Being in the specialty foods industry for nearly 16 years has given me a different perspective on food and the people who help make it. I have admiration for the large companies, like Chobani, who churn out millions of units of their products every day as well as chefs like David Mao at David’s Noodle Bar, who lovingly hand rolls his famous pork dumplings, one at a time. Anna was home for spring break and we decided to take a road trip to visit a small lunch spot in Siler City, named by OnlyInYourState as ‘The Best Burger Joint’ in the state. It was about a 90 minute ride, but spending the afternoon with my daughter while searching for burger nirvana ranks up there as the perfect way to spend an afternoon for me. We arrived at Johnson’s Drive In just before the lunch rush and a line had already formed. One line for take out and one for dine in. It’s a small place by today’s standards. A dozen stools at the counter and about six booths all covered in green leatherette – it feels like stepping back in time, in a good way. The place was busy for sure, but there was no feeling of anyone being rushed. Johnson works the grill like a master conductor with skills only time and experience can produce. The waitress attends to each of the diners, welcoming ‘outsiders’ like us, as well as regulars who don’t even need to order – she knows. The menu is on the wall above the grill, no need for printed paper in this place. I think I remember seeing an option for hot dogs, but I’d be surprised if Johnson sells more than a few every now and then. People come here mostly for one thing – cheeseburgers. I struck up a conversation with another traveler who made a detour to stop in that day. He recommended the cheeseburger all the way with homemade chili, slaw, onions and mustard. We were seated at a booth and the waitress came by to take our order – cheeseburger all the way, fries and a sweet tea. If you are going to sample the best of Southern cuisine, this is a must. Burgers are cooked to order, so it takes a few minutes longer than your typical fast food variety. But when she delivered them in a sheet of waxed paper, they were piping hot. I mustered up the self restraint to stop for a couple of quick photos, then carefully bit into Johnson’s hand crafted masterpiece. It was so good, I actually got goose bumps. Wanting to take in the full experience, we decided to try a slice of Chocolate Pie from the menu. The waitress apologized, but they were all out. “I could bring you another burger?” Sold. We savored every bite, taking in not only the food but the atmosphere. 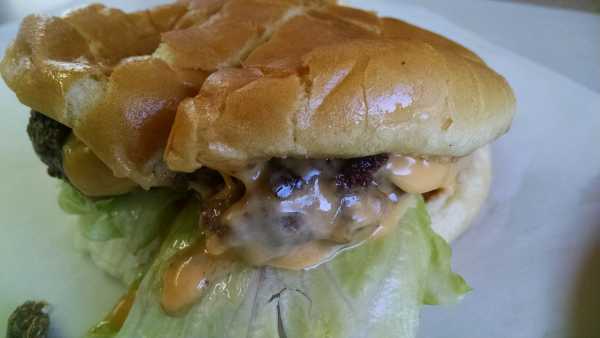 The burgers were good to be sure, but Johnson’s was more than that for me, it was an experience, something we focus on every day at Anna’s Gourmet Goodies. Watching the customers, the staff and the Burgermaster himself gave me pause to think about our cookie business and what I might learn from someone who has been doing basically the same thing for nearly 71 years. Claxton Johnson starts his day early in the morning when a delivery truck comes by with full sides of Western grain-fed USDA Choice beef. He picks out only the best beef, and then grinds it fresh into portions for the day’s burgers. No frozen, pre-made patties here. We pick up our flour from Lindley Mills, crack fresh eggs, and mix each batch of cookies adding one ingredient at a time. No pre-mix in our bakery. Johnson’s Drive In is open Tuesday thru Saturday from 10 a.m. until 2 p.m. No nights, no mornings. No telephone to call in orders. No credit cards. No expanded seating or second location. When the day’s meat is all cooked, he shuts down the grill. We operate our business via AnnasGourmetGoodies.com. We bake and ship cookies Monday thru Friday throughout the year, with some exception made during the Holiday Season. We have no plans to open a store or distribute cookies via retailers. Claxton Johnson makes great cheeseburgers. His hamburgers are good and I’m sure the hot dogs are as well. But cheeseburgers are his masterpiece. We make chocolate chip cookies. Our oatmeal raisin cookies, brownies and shortbread are all very good, but our chocolate chip cookies are outstanding. As we stood up to leave, I took in one last look around, watching the master at work on the grill and at the lunch counter. I started to edge over and tell him about our experience, but I decided not to break his stride. He knows. In his book The Outliers, Malcolm Gladwell talks about the 10,000 hours required to master a skill. Claxton Johnson passed that mark long before I was born. And I like to think we’ve passed that mark making our gourmet cookie and brownie gifts a while back as well. I love to seek out other artisans and masters in the food world to see what I can learn from them. While I don’t expect to ever be in the cheeseburger business, I walked away with more than a full stomach and a smile, feeling as though I spent a little time in the presence of a master of his craft. That’s the feeling we strive to create every time someone bites into our chocolate chip cookies. Goosebumps would also be nice.